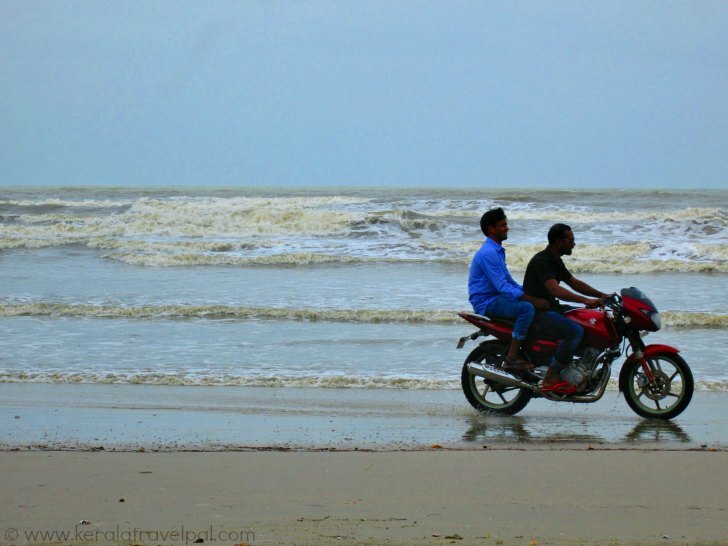 Muzhappilangad beach (also Muzhuppilangad) enjoys the distinction of being the only drive-in-beach in Kerala. Probably among the best drive-in-beaches of the world, lengthy stretch of 4 kilometres can be driven with ease without any fear of getting stuck in sand. And the good news is, it is rightly legal to drive along the beach. The 7 kms long beach attracts its fair share of visitors, mostly those who want to enjoy a fine ride through the sandy shore line in their car or on motor bike. The beach is almost empty during weekdays. Even if you happen to be there while crowded, still it is possible to find isolated areas where you are not bothered by vehicles or the crowd. As the initial reluctance wanes, venture into adventure begins! Some cannot resist splashing water with their vehicles, while others put speedos to a bit of a test. Another interesting feature of this coast line is the black rock formations. They take off the strength of the waves. Water splashes gently and enticingly around small clusters of rocks. This beach is a swimmers delight! Even with such an added advantage, swimming here is not the focus as most visitors opt for beach driving. You can lie on one of the rocks enjoying the vast expanse of blue unless chose to get a bit active with some swimming. You can also safely walk into the sea for several hundred meters. The beach curves in a wide area, from where visitors can get a good view of areas of the north. It is usual to see fisher folk in action. As you can see in the picture below, it takes concerted effort of several people to get a boat out of water. Dharmadam Island is just a few hundred meters away from the southern end of Muzhappilangad beach. A short drive through the coastal road will take you to Dharmadam beach. From Dharmadam beach, it is possible to walk to the island. The catch though is you can do it only during low tides when water is only less than knee deep. If you walk to the island, make sure to get back before the return of high tides. Dharmadam Island is a tourist destination in its own right. Government purchased the Island from the local family that owned it for generations. 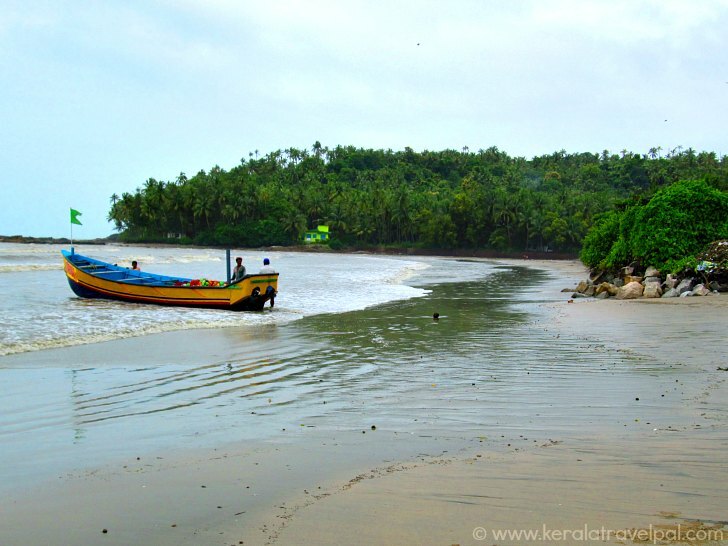 The coastal village of Muzhappilangad is renowned locally as the place of Sree Koormba Temple. The three day festival here is held in March every year. The highlight of this festival is the lengthy procession (colloquially called thaalappoli) carrying a sacred brass receptacle (Kalasham). Muzhappilangad beach, liked by locals and tourists, is one kilometre west of Kannur- Thalassery highway. Distance to the nearest town of Kannur is around 15 kilometres. Proceeding from Kannur towards Thalasseri, take the road to the right, past Moidu Bridge and ahead of the railway cross. Since it is a 7 km beach, there are multiple paths and entrances to the beach. The nearest railway station Thalasseri town at 8 kilometres. Even though there is a small railway station in the nearby village of Dharmadam, only a couple of local trains stop there. The nearest Karippur International Airport at Kozhikode (Calicut) is about 93 kilometres south. Nearest towns : Thalasseri at 6 kms, Kannur at 15 kms and Mahe at 17 kms. Bus Station : Thalasseri Bus Station at 6 kms. Taxi / Auto Rickshaw Hire : Thalasseri Town at 6 kms. Railway Station : Thalasseri Railway Station at 8 kms. Air port : Kozhikode Int’l Airport (CCJ)at 100 kms. Food Options : No food available on Island. Several restaurants in Kannur,Thalasseri and Mahe towns. Accommodation Options : Hotels and lodges at Kannur and Thalasseri. A few home stays and small lodges near the beach as well. Best time to visit : October to May. Can be visited throughout the year although monsoon can spoil some fun. Nearby Attractions : Dharmadam Island, Andalur Kaavu,Thalasseri fort, Arakkal Museum, Meenkunnu Beach, Kannur Fort, Mappila bay, Kannur town( shpopping & food), Payyambalam beach, Sea View Park, Vismaya, Parassinkkadavu Madappura, Snake Park, Kizunna Ezhara beach, Thottada beach, Kottiyoor Temple and Pythal Mala.